Organizations in Ontario work hard to support, sustain and promote the Scottish Gaelic language, history, culture and community though a variety of ways. They create exciting opportunities to connect communities to learn about and celebrate Scottish Gaelic culture. Please let us know if you are aware of other Scottish Gaelic based organizations in Ontario and we are happy to share them on this page. In addition to Comunn Gàidhlig Thoronto's events, check out community-related events and opportunities at our Community Events & Info page. 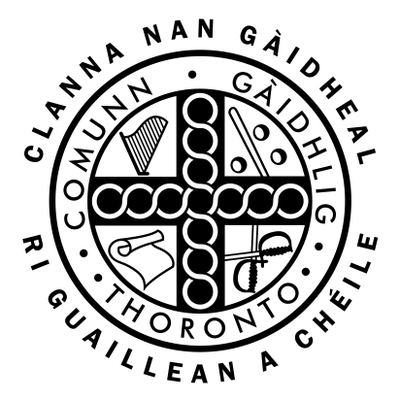 The Toronto Gaelic Learners Association (CLUINN) is a non- profit community organisation dedicated to promoting and teaching the Scottish Gaelic language. Non - credit classes are offered throughout the fall and winter months on Saturday mornings. Summer classes are held in April and May if there should be sufficient interest and if there are instructors available. A nominal tuition fee is charged to cover costs, as well as the purchase of teaching materials. The Scottish Studies Foundation is a Canadian charitable organization to encourage research, both inside and outside universities, in Scottish culture -- history, literature, religion, art, law and in Scottish migrations to North America; and to publish historical studies and documents relating to Scottish culture and migrations. Our present emphasis is aimed at raising the awareness of the Scottish heritage in Canada through various levels of education including the funding of academic scholarships in Scottish Studies in Canada and Scotland. The Foundation offers a Colloquium a couple of times a year and has access to a variety of resources. Established in 1836 to assist immigrants from Scotland, the St. Andrew’s Society of Toronto remains a vital part of the city’s cultural and charitable community. They celebrate Scottish heritage and culture throughout the year, with events such as a Burns Dinner, Spring dinner, Fall Meeting, and St. Andrew's Charity Ball. CASSOC is an organization for organizations. They are the link between various Clans and Scottish Societies. They encourage the celebration of Scottish Cultural Heritage and the promotion of Scottish Culture in all its aspects. They seek to be the assembly of all groups who are pursuing Scottish interests. They also maintain a list of events across Canada, including Highland Games. Please check CASSOC's website or our News page for information and events from CASSOC. Comhairle na Gàidhlig is a non-profit society dedicated to the maintenance and promotion of the Gaelic language and culture. It works with individuals and groups throughout the province and throughout the world to preserve and perpetuate our distinct Gaelic culture. Comhairle na Gàidhlig is committed to representing the individuals, organizations and institutions of which the provincial Gaelic community is composed. To support Nova Scotians in reclaiming the Gaelic language and identity by creating awareness, working with partners and providing tools and opportunities to learn, share and experience Gaelic language and culture. The mandate of Comunn Féis an Eilein is to promote and preserve Gaelic language and culture through means that are commensurate with the values of our community. A Féis (faysh) is a community-based festival designed to promote the Gaelic language and culture of an area. Slighe nan Gaidheal is a non-profit educational society that teaches and promotes the Scottish Gaelic language and culture in the Pacific Northwest. Bòrd na Gàidhlig works to promote Gaelic and strives in partnership with the Scottish Government, the people of Scotland and the Gaelic organisations to improve the status of the language throughout Scotland.